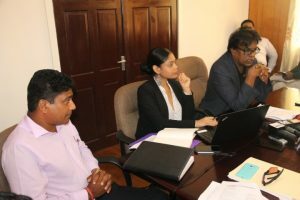 Several companies, including a United States (US) company with Middle Eastern connections, have bid to buy three of the six sugar estates owned by the Guyana government, on condition the buyers would continue to plant sugarcane and guarantee local employment, officials said Thursday. Managing Director (Deals) of PricewaterhouseCoopers Tax and Advisory Services Limited, Wilfred Baghaloo said the prospective investors, before submitting their bids, had questioned whether they would be competing with the state-owned Guyana Sugar Corporation (Guysuco) for the same markets, access to cane varieties and the nursery and shipping logistics. “The major concerns of potential bidders related to regulations that are needed to ensure fair competition between government, that is the legacy Guysuco,” he said. “As you know the government has agreement with SPS, a sugar protocol with the US (United States) government for access to sugar. We no longer agreements with the EU (European Union) but, in making their assessment of markets, they would like to know do they have access to the same markets,” Baghaloo added. Other areas of concern by the likely investors, he said, included the state of the assets such as whether they are scrap metal or a potential going concern. The National Industrial and Commercial Investments Limited’s (NICIL) Special Purpose Unit has been reactivating the Enmore, Skeldon and Rose Hall factories to offer them as going concerns, months after the Guyana government had closed them down. Baghaloo declined to immediately release the names of the companies, but said they included one from the US/Middle East and several other local companies. He promised to release the bidders’ names on Friday after sifting through the 10 submissions to first ascertain which companies submitted bids for one or more than one estates. “We got ten envelopes but that doesn’t mean we got ten bids and we are not able to determine that,” he said, adding that the team knows the names of the companies but first needs to summarise them….In other words, you can have one person submitting three bids,” he said. The PricewaterhouseCoopers official said the bidders include one based in Florida with shareholders in the Middle East, and other companies from the Caribbean. The locally-owned Demerara Distillers Limited has long expressed an interest in taking over the Enmore Estate/ East Demerara Estate. Privatisation Specialist at the National Industrial and Commercial Investments Limited’s (NICIL) Special Purpose Unit, Shawn Persaud said buyers of the Skeldon, Enmore and Rose Hall estates would be expected to use the sugar industry specific infrastructure and the labour. “There would be some importation of labour but that’s mainly the technical people if they can’t find them here but our casual workers have to be employed,” he said. Baghaloo said sugarcane could be used to produce cosmetics, molasses, sugar crystals, liquid sugar, and electricity generation. Although the bids were opened at 4 PM Wednesday in the presence of officials of PricewaterhouseCoopers, Auditor General’s Office, members of the steering committee and bidders, Baghaloo said he could not disclose the names now. Going forward within the next 30 days, he said business and asset valuations would be conducted, ascertain whether the bids complied with the information memoranda that were sold at US$1,000 each, analyse the bids in keeping with the evaluation criteria, made recommendations to the Steering Committee and the National Industrial and Commercial Investments Limited’s Special Purpose Unit which would eventually make recommendations to Cabinet. The PricewaterhouseCoopers official said the government could still refuse the bids, as has been stated in the information memoranda. “The government is not bound to accept any of the bids,” he said, adding that many requests had been made to reopen the process because the factories were being restarted and others had bough the information memoranda late. The business valuation would focus on current and future cash flow, while the asset valuation would determine today’s value of assets, age, place of manufacture, functionality and where the assets can be used. “What the government does with the valuation is their business,” he said. Before submitting their bids, they were given access to “virtual data rooms” containing factory production data, financial statements, draft agreements, drone shots of the factories and fields and all other relevant information. After the estates were advertised in July 2018 in mainly Barbados, Jamaica, Belize and Trinidad, he said a pre-bid meeting was held in September to inform potential bidders that evaluation of their submissions “will be heavily driven by a technical proposal” comprising 70 percent of the total score. That includes financial capacity, experience in the sugar industry, quality of corporate governance, quality of management, extension programme for cane farmers, targets for attaining full capacity of their development plans, quality of such plans and how they will support businesses. The remaining 30 percent includes how the investor plans to pay government for the estates. Baghaloo said if someone pays off for the estates at once, they would have to pay more. “Our primary objective is to get qualified, experienced, competent and well-structured proposals, bidders to operate the factories for the foreseeable future and that is why price is not the main driver and why a technical assessment is always given preference and ranking,” he said.